As you probably know, Minnesota is in the midst of a government shutdown due to lack of a budget. My daughter is doing a project for me putting together the names and contact information for all 50 state parks directors. It turns out the MN parks web site is shut down. LOL. I am the only one in my company with access to or capable of updating our web site, but I can go away for weeks, even months, and have the web site stay up. This strikes me as either stupid, or a gratuitous effort to purposely make the shutdown more dramatic than it needs to be. To the latter point, our company operates many Federal parks. Since we take no money from the government and use no government personell in doing so, the parks we operate typically stay open in a Federal shut down. Except for the last threatened shut down several months ago, when our contract managers seemed to be getting guidance from their higher ups in the administration to shut the parks down, even when they did not need to be. I presume this was for the purpose of making the shut down seem worse to the public. After all, we would hate to have a government shut down and have nobody notice. It will be interesting come about August 2 to see if we remain open. Yep, I admit it, air conditioning may indeed be causing us to measure higher temperatures. 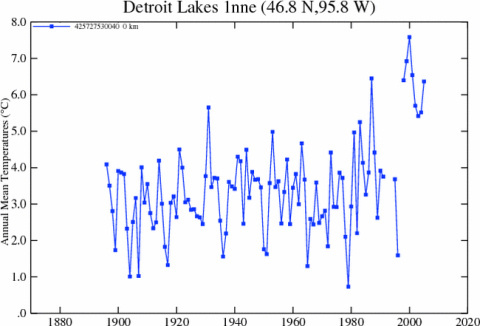 Here is the historic temperature plot of Detroit Lake, MN, one of the thousand or so measurement points in the data base that is used to compute historical warming in the US. Look at that jump in the last 10 years. It must be global warming! 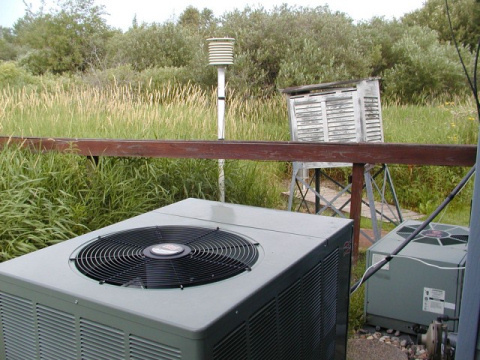 Can't possibly be due to these air conditioning units installed around 2000 and venting hot gas on the temperature instrument (in that round louvered thing on the post). More from Anthony Watts, who is leading the effort to document all these stations. You too can help. The odds are you live less than an hour from one of these stations -- take your camera and add it to the data base. Its fun! Incredibly, the global warming community still argues that documenting the quality of the installations used in the official global warming numbers is unnecessary. More air conditioners blowing on official temperature measurements here. Worst temperature installation found to date here, "coincidently" at the site with the highest measured 20th century warming.